October 2017 saw the reunion of Tracii Guns and Phil Lewis as L.A. Guns with the release of their first album together in over 17 years entitled “The Missing Piece”. With a new-found energy and the enthusiasm L.A. Gunsstormed onto the stage in Milan, IT for the 2017 edition of the Frontiers Rock Festival they recorded their mind-blowing set and the rest is history. Today the band releases a live video taken from this event for the song “No Mercy”. Watch it HERE. This once in a lifetime performance was recorded and will be released on CD, DVD and Blu-Ray formats. 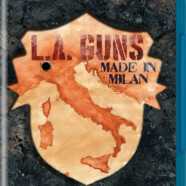 The album, which is aptly named “Made in Milan”, will be released March 23rd via Frontiers Music Srl. The band has also launched a pre-order store in the U.S. that includes signed items, t-shirt bundles, vinyl, and more. Visit the store HERE. This current incarnation of the band has been touring non-stop and the cohesiveness of the unit, not to mention Phil’s stunning and unique vocals and Guns’ mind-bending guitar playing, are on full display here. A must hear and listen for all fans of the band, both new and old school!